You might as well set up the visual side of iPad first so your interaction with the device is easy on the eyes and battery power. 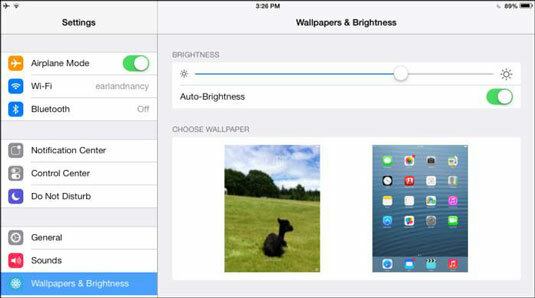 Two such settings fall together as one category in the Settings pane: Wallpapers & Brightness. Especially when using iPad as an e-book reader, you may find that a dimmer screen reduces strain on your eyes. Also, reducing the brightness when using any app can save a little on your iPad’s battery life. In the Settings pane, as shown in the figure, tap Wallpapers & Brightness. To control brightness manually, tap the Auto-Brightness On/Off button (refer to the figure) to turn it off. Tap and drag the Brightness slider to the right to make the screen brighter or to the left to make it dimmer. Tap the Home button to close Settings. If glare from the screen is a problem for you, consider getting a screen protector. This thin film not only protects your screen from damage, but can also reduce glare. These are available from a wide variety of sources (just do a web search for iPad screen protector) and cost about $2 each. In the iBooks app, you can set a sepia tone for book pages, which might be easier on your eyes.